Did you know? - After the revolution, the country was crippled by years of war, its agriculture devastated, its formal commerce nonexistent. 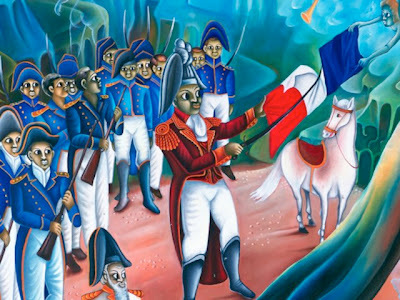 - Haiti was forced to make reparations to French slaveholders in 1825 in the amount of 150 million francs, reduced in 1838 to 60 million francs, in exchange for French recognition of its independence and to achieve freedom from French aggression. This indemnity bankrupted the Haitian treasury. - The Haitian Revolution was influential in slave rebellions in the United States and British colonies. - The Haitian revolution brought the slavery question to the forefront of US politics, and the resulting intensification of racial divides and sectional politics ended the idealism of the Revolutionary period. - Many of the white and free people of color who left Saint-Domingue for the United States settled in Southern Louisiana, adding many new members to its French-speaking, mixed-raced, and African populations. - Because Napoleon was unable to regain control over Haiti, he gave up hope of rebuilding a French New World empire. - The loss of revenues from Saint-Domingue's sugar plantations made maintenance of Louisiana impractical. Similarly, as a result of debts incurred fighting the slave revolt, Napoleon was forced to sell the American government its territories in Louisiana at a heavily discounted price. - Such a large-scale slave rebellion was never repeated.